Around one in seven new mothers experience postnatal depression (PND). There’s more to motherhood than blissful baby-gazing. Postnatal depression (PND) is very common – around one in seven new mothers experience PND – so why do so many women suffer in silence? Although PND usually occurs within a month or two of giving birth, depressive symptoms often initially set in during pregnancy. 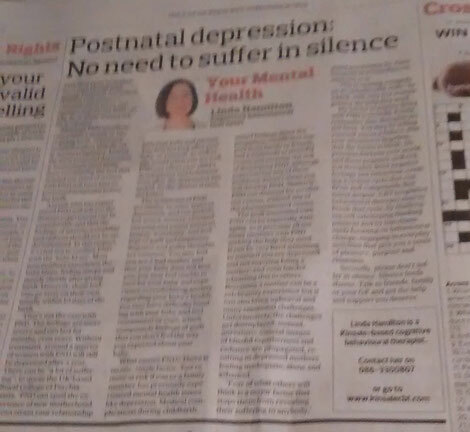 Indeed, the term perinatal depression is increasingly used nowadays, recognising the fact that around one third of women with PND will have first experienced symptoms before the birth. The symptoms of PND are similar to other types of depression, and can include low mood, anxiety, changed sleeping and eating patterns, fatigue, irritability, and feelings of guilt and emptiness. Negative and guilty thoughts are common. You may feel you are a bad mother and that your baby does not love you; you may feel unable to care for your baby and experience overwhelming anxiety regarding your baby’s health; you may have difficulty bonding with your baby and feel resentment or rage, which compounds feelings of guilt that you don’t feel the way you expected about your baby. What causes PND? There is no one, single factor. You’re more at risk if you or a family member has previously experienced mental health issues like depression. Medical complications during childbirth, mixed feelings about the pregnancy, insufficient support from family or friends, and a multitude of stressful events can increase the risk of developing PND, although experiencing any of these problems doesn’t mean you will develop PND. Similarly, PND can descend for no obvious reason, without any of the aforementioned causes. The guilt associated with PND can be especially damaging, as it prevents all too many mothers with PND seeking the help they need. It can be very hard admitting to yourself you are depressed and not enjoying being a mother, and even harder admitting this to others. Becoming a mother can be a celebratory experience but it can also bring upheaval and many emotional challenges. Unfortunately, the challenges get downplayed; instead, unrealistic societal images of blissful togetherness and radiance are propagated, resulting in depressed mothers feeling inadequate, alone and ashamed. “Fear of what others will think is a major factor that stops them from revealing their suffering to anybody”, noted psychiatrist Dr Alain Gregorie in a Guardian column last year. “This is causing a tragedy on an unbelievable scale”, he added, with very few women getting the help they need. My advice to anyone living with PND is twofold. Firstly, remember this: thoughts are not facts. You may be telling yourself you’re a failure, that your situation is hopeless, that the future is bleak. Depression darkens your world, and these negative, self-critical thoughts drive negative feelings and behaviour, creating a vicious cycle that confirms and compounds that initial despair. CBT (cognitive behavioural therapy) aims to break that cycle, by challenging self-sabotaging thinking patterns and by simultaneously focusing on behavioural change, engaging in everyday activities that give you a sense of pleasure, purpose and closeness. Secondly, please don’t suffer in silence. Silence feeds shame. Talk to friends, family or your GP and get the help and support you deserve.